I know–aren’t we great!? I have to pinch myself sometimes. Fortune wonders if Schmidt’s comments are a sign of “a dangerous culture of self-righteousness.” They are. Here’s what Schmidt said to a different crowd, of Wall Street analysts, in an October conference call: “We love cash.” That’s the full sentence he uttered. He had nothing to say on the call about Google’s noble information “mission. Come on, St. Eric: Google did not make $15 billion in profits over the past year on accident. The company exists to make money for its investors and executives. Period. And that’s not something you’d have to apologise for if you’d drop the old saw about how Google is too virtuous to chase money and how it really just wants to make us all smarter. It’s a truly bizarre moment, in which Cutts defends some horrendous management decisions based on Wall Street trades. If the last two years have taught this country anything, it’s that the connection between stock performance and executive competence is pitifully weak. But at Google financial gains have not been correlated with innovation. The company still gleans nearly all its profits from its core, longstanding contextual advertising business; its many many side projects and acquisitions add little to the bottom line. So Google shouldn’t get too excited to see its stock is up 77 per cent the past year versus 59 per cent for the S&P 500, or to be accelerating its hiring while national unemployment is stuck at 10 per cent. Profits do not mean you’re connecting with users’ most pressing needs. If that were the case then Microsoft, flush with revenue from its old-line Office and Windows businesses to this day, would have clobbered Google in Web search years ago. Google wanted a big debut for Google Buzz, its attempt to copy the likes of Twitter and FriendFeed. So it bypassed an established “beta” testing system and launched Buzz with no external trials. It also built Buzz into GMail to get more users. This ended up screwing users over on privacy; Buzz was automatically sharing their lists of most-emailed friends with the world. What we’re going to have to come to terms with is this stuff happening more. I honestly don’t think it’s a bad thing for people to be exposed to the issues this way. So terrible privacy violations like sharing your location and work address with an abusive ex-husband and other unauthorised parties are the necessary costs of progress and not “a bad thing,” according to one of the key engineers behind Google Buzz. In fact, they are learning experiences. Engstrom said this, by the way, on the same podcast where the abusive ex-husband was discussed, so it’s not like he didn’t grasp the full implications of what had happened. But he was hardly alone in framing privacy abuse as inevitable and necessary. In a later podcast, Cutts said that while Buzz perhaps needed more testing, rapid deployment allowed Google to get rapid feedback on Buzz and “iterate” quickly and “try out a lot of different things” (see latter half of clip above). Translation: It’s very effective for Google to use the actual relationships of actual humans to test unproven social networking code. And conveniently, Google doesn’t have to endure the sometimes painful cost of this testing! Of course, there’s a more ethical alternative: Use consenting beta testers like the “Trusted Testers” Google has already organised to test innovative social products, rather than rushing into something to get big fast. When Google launched Buzz, it thought people would by dying to see the product pop up all over the place: in Google GMail, Google Maps even Google search. Google VP Vic Gundotra openly talked about using those properties to promote Buzz in an interview with Silicon Valley blogger and startup advisor Louis grey. See the short clip above. But this sort of integration proved to be Buzz’s biggest weakness: The combination of Buzz and Gmail cluttered up people’s inboxes and, quite controversially, made it possible for Buzz to compromise users’ privacy by combing their email logs. Google should have known such deep integration would be a bad idea because, as we noted the day Buzz launched, the company experienced a very similar controversy when it hooked Google Reader up to GMail two years ago. It seemed unfair and sleazy, not convenient, when Microsoft started using its operating system to promote its online services, streaming media technologies and Web browser. Google isn’t quite as suspect as Microsoft but, in the eyes of the public, it’s increasingly getting close. Especially when it comes to search. And the public will be increasingly hostile to Google product bundles that are more about promotion than functionality. Google brags about finding, and keeping, “the world’s best engineers;” it even avoids offering jobs to some top coders to avoid an over-concentration of awesome. It takes pride in its notoriously lengthy and rigorous interview process, and in coddling workers once they clear it. The company certainly gets tons of free press for the free food and massages. But the system seems increasingly broken. The hiring system, it turns out, was nearly rejecting Google’s best employees and riddled with bizarre or terrible questions. And as for retention, some of Google’s most ambitious employees saw their work buried; some complain until they quit. Whenever Google’s actions spark criticism, the first response of the self-regarding Google priesthood seems to be to insist the critics are simply bewildered at the company’s complicated brilliance. For example, in December Schmidt made a rather chilling statement on CNBC about secrets (which we were the first to highlight): “If you have something that you don’t want anyone to know, maybe you shouldn’t be doing it in the first place.” The quote set off a firestorm of controversy. Google rather absurdly argued that Schmidt had been misunderstood and taken out of context; in a statement circulated at the time its flacks claimed Schmidt was “talking about the US Patriot Act.” Sure he was — after he gave his little lecture about the villainy behind secrets. There’s plenty of context in the video clip we ran, reproduced above. Schmidt was right that there’s a lot of confusion around Google. Unfortunately for him, much of that confusion seems to originate in the company itself. Hopefully the Todd Jacksons of the company will have a chance to educate their peers on the realities of life outside the Googleplex. 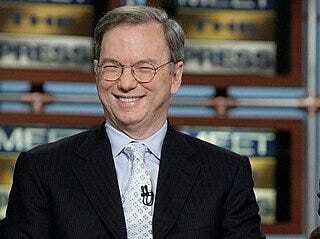 Eric Schmidt included.